We know speed is a crucial factor when it comes to blogging from both SEO and visitors standpoints. There are lots of things to make your blog load faster. All things being equal, the faster your blog, the better your chances of grabbing Google’s attention. As a reader, it will be wrong judgement to sit before your screen and estimate the number of seconds your blog takes to load. This is because there are lots of other factors that may affect your speed mainly, your bandwidth and device speed capacity (PC, mobile, etc). To have the actual load speed of your blog, you need to use tools. While I’ll talk about one of these tools below, I just want to mention what I did for better performance of my blog. I fired W3 Total Cash! W3TC is an excellent free WordPress Blog Optimization plugin with tons of options. In this post, I’m not giving you details how to configure this plugin. However, for an average user, setting up w3tc is going to be a little tough. I ran my blog for about 12 months with this plugin. My GTmetrix optimization test results dangled between 2 and 8 seconds. Now, 8 is too slow and I know about that. WP Rocket makes things so friendly. Basically, with the default settings, most users will find their blogs optimized to a highly reasonable level. Here is what the settings page looks like and for most of us, this is all we need to get our blogs going. Better result isn’t it? And this is worth the investment. 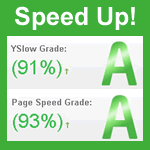 Both Page Speed and YSlow grades have been improved. Load time reduced. Though this may not be the best, it has taken my blog near fast. A little more optimization, doing away with some unnecessary plugins is inevitable the maximum performance. So how much is WP Rocket? I think this plugin is quite affordable and should be part of your investment to have a better blog. I always say free is good but paid is better. Why because you get attention from experts who make sure you get what you want. So let me hear what you think in the comment box below! Is your blog fast enough? What are you using as cache plugin? I am new to blogging and main problem with my website is the slow page loading. I haven’t tried wp rocket but will give a sure try. Thanks for providing this valuable info. Great article about how to use WpRocket to reduce the speed of a blog. I will try out this plugin on my blog as well. If it works as you have written – I know it would also work for me, then grabbing up the plugin is worth the money invested. so far have seen lots of post on WP and is like am falling inlove with WPblogs. Thanks for awesome post. You describe each and every point very clearly to make our blog load faster. Do you have this plugin already? nice one, i never knew WP Rockets rocks and has nice and superb features which outshine it competitors, am subscribing to it one time. Wonderful review again. It seems like a very useful plugin. Load time speed is needy for every people. We must have our website loading time in less than 2 sec. My blog’s loading time is quite good now around 2-3 Sec. But, I want more better performance. Hope, this plugin will be beneficial for reducing load time. I will look forward to have it soon. Thanks for sharing this helpful review with us. Have a nice day! Yeah loading time of your blog matters and if its over time even with fast internet connection, you got to worry because visitors are really annoyed by this. Finally, another convert! It’s damn great out of the box. I removed W3 totally because of Rocket. I didn’t even have to tweak it. But after adding a CDN on one of my sites, it did make it a lot faster after. Very nice plugin from their team. Nice post and Yes, loading time really plays very important factor these days. W3TC is nice plugin and I am also using it but this WP Rocket really seems interesting and helpful. I will surely give it a try. Thanks for sharing it with us. Hi Muki, I am happy i found your blog from G+, i can that i have a lot to learn from you, i admire you and your rapid success. Making blog load faster is the heart desire of every blogger, though i m new to this industry but still i know this is true. I know there are better things for us ahead so let’s stick together. So how is your country? Enstine, that is a great price to boost your website’s speed. I’ve been using the same one for years and it could use an update. Right now Hostgator I believe is down and can’t get to my backend. (First time in over a year an issue with hosting)…..Anyways I may give it a try. I need to do more updates to my blog in the coming months. Thank you for sharing this as speed is so important today between laptop, tablets and especially on mobile. Good to see you around today! Yeah speed is a key factor and this plugin can really do the magic and the price too is reasonable. Let me know if you are finally grabbing a copy. Do have a wonderful week dear friend. I am OK with W3 Cache but facing big problem regarding image optimization. I was looking for a best solution regarding this problem. After reading your article I think I got the solution. I need to have a try of WP Rocket. Thanks for guiding on a very important topic. Many bloggers try to avoid resolving the blog speed issue and remain happy if their blog takes more than 2 seconds. Also unreliable speed checkers show quite rosy picture and a few of them just trying to convert bloggers show their statistics quite attractive if they want to improve further with a little investment. You are right it is easy to install W3Total but its optimization is not everyone’s job. My two blogs are also suffering from slow speed and am seriously thinking to go for a premium option. This is exactly in my scheme of investment after buying a few products of important nature. I have W3TC and you are right. It’s darn confusing to set up and I screwed it up each time which is why I had Ashvini set it up for me. It still gets blamed for issues I have on my blog so when you deactivate it then I have even more issues. I would be scared to touch anything right now. These types of plugins I know nothing about and I know they don’t play nice with every theme so I’m not sure if I’ll go this route right now or not. Maybe if I can get someone to set it up for me I might but other than that I think I’ll stick with what’s working for me right now. Load time is important but until people start complaining I’m not going to obsess over it! Glad you’re enjoying this one though and thanks for letting us know about it. WP Rocket is a great and excellent plugin for blog optimization and speed issues. Am surprised this very plugin has many features than our very own W3TC! But then there’s a huge difference between FREE and PAID. Guess that’s just it… Good to see your blog loads faster than ever! Just witnessed this myself. Hope to grab a copy of the plugin very soon. Wow I have never come across such plugin but I believe there could be a very big difference between paid and free version. Because is not all features that will be open for free version. Anyway thanks for revealing such plugin Sir. Will definitely install this plugin on my blog, but before reading this i was having confusion between W3 Total Cache and WP Rocket but now i know which is better. WP Rocket for sure rocks! I never knew I can increase my site speed and as well get an optimum performance until I came across and used this plugin. What I like most is its simplicity and easy configuration, far way better than W3 Total Cache I was using before now. Enstine this is indeed a great share! It was my first visit to your blog and I really found the post full of useful information. I was completely unaware from the plugins that you have described in the post. And I surely want to try this. There are a number of ways in which you can improve the speed of a WordPress website, like using some caching plugins etc. however hosting your WordPress website on a fast and reliable SSD VPS will make the biggest difference. I agree, Hosting is the main factor which has major impact on site loading speed. But beside that we must be careful about design and image optimization as these play 2nd major role in loading a website. I been new to WP Rocket Plugin, now am going to have this for sure and thanks a lot for awesome words. WP rocket looks really impressive.. Till now W3 total cache has been giving me fruitful results. Gonna try this one too. Perhaps, I really need with this tool for another time. But I have to try first in order to know further about WP Rocket. Thanks for valuable post with us. You describe each and every point very clearly to make our blog load faster. Most of the wordpress plugins help to increase site speed. WP Rocket is also one of the best plugin. I use this one regularly.